Hailing from Bondi Beach in Australia, Patrick's line of haircare products got us hooked as one of the best men's grooming brands out there. Now, they've introduced their line of skincare products with the same level of attention to detail to both the ingredients and packaging as found in their haircare line. 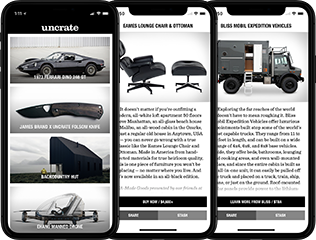 In this exclusive North American release with Uncrate and Patrick's you'll find the FS1 Face Scrub and FW1 Face Wash. The scrub is comprised of volcanic sand and crushed diamonds, while the foaming wash contains Green Tea, White Tea, Lemon Myrtle, Vitamin C and other ingredients to ward off signs of premature aging. Each are produced in the USA, are free from parabens, sulfates and phthalates, are cruelty free, and 100% vegan. While Patrick's FW1 Face Wash will cleanse your face, it does have a few more tricks up its sleeve. The foaming cleanser utilizes a range of ingredients like green tea, vitamin c, oat kernel extract, and sunflower seed oil to activate cellular regeneration, soothe skin, and reduce redness. Its antioxidant-rich formula protects the skin from environmental damages and also eliminates shine for a matte finish. The result is one of the best anti-aging men's face washes on the market, and equally as impressive is the Patrick's signature packaging it is housed in. FW1 is paraben, sulfate, and phthalate-free, so feel free to use it every day. Fire and ice are generally foes but in this instance, they're living harmoniously in a dual-action exfoliant. Using volcanic sand and crushed diamonds, Patrick's FS1 Face Scrub unclogs pores and removes dead skin for a deep clean. In doing so, it improves skin tone while minimizing pores, reducing ingrown hairs, and can even fade small scars. With its added anti-aging peptides, multivitamins, and anti-irritants, the scrub also acts as a facial treatment that encourages the regeneration of cells, reduces redness, and retains moisture for smooth and hydrated skin. Charcoal can pull contaminants out of your face, not just your whiskey, and this face wash removes excess oil like a...like a well-oiled machine, really. Activated charcoal extracts impurities from deep in the pores; olive oil lifts dirt and excess oils from the skin; jojoba creates a protective layer atop the skin that thwarts environmental toxins; and last, but not least, aloe adds extra moisture to keep the skin firm and healthy. A proper night's rest is essential to good health. The Nue Co. Sleep Drops help ensure you clock in those necessary eight hours with a natural formula. Made from valerian root and passionflower, the non-habit-forming sleep aid slowly shuts down the body allowing you to drift off to sleep with ease, while also reducing anxiety with a blend of catnip and chamomile. Because of its wholesome ingredients, you'll be able to reap the rewards of your blissful slumber without any drowsy side effects. Bixby prides itself for pinpointing the optimum drag of a comb for a certain hair type: That is, the ideal distance between each tooth (1.3mm) and length of each (19mm). This provides gentle separation for detangling or distributing product without any tugging or torturing. Available in black or amber, their wide tooth comb measures 133 x 5.5 x 35 mm, and arrives inside a tin travel case, and it's ideal for thicker hair types where more texture is needed for styling. Barber meets bartender for a healthy, soothing shave. In its "Watermint Gin" shave cream, the fresh-faced pros at Blind Barber combine antiseptic and antibacterial juniper berries (a key ingredient in gin, as well) with the soothing and refreshing powers of watermint. It's gentle on all skin types--even dry, sensitive, or oily--and builds a quick, brushless lather right in your hands. Build a lather in palms with a nickel-sized amount (more as needed). Apply directly to warmed, freshly washed skin. Inspire your mind and alert your body with MINERAL's CBD for FOCUS formula. FOCUS is a 1:1 cannabinoid to terpene blend with dense amounts of CBD and a custom terpene blend that features concentrated amounts alpha pinene to inspire alertness and improve mood. MINERAL creates synergistic relationships between Colorado grown cannabinoids and terpenes for targeted benefits. FOCUS is a terpene forward formula to reduce inflammation, improve mood and increase energy levels. Your skin needs immediate attention after a shave, when it's most susceptible to burn and infection. Help it rebound pain free with this soothing aloe-packed aftershave lotion from Brickell. It also uses coconut oil to nourish and rehydrate the skin, as well as hyaluronic acid to help retain this moisture and restore elasticity. After shaving, splash the face with cold water to tighten pores. Then, apply a nickel-sized amount of product to the freshly shorn skin. Just like their combs, Bixby's Beard Pick is the ideal tool for taming and styling your beard. Made from premium acetate, the same material found on your high-end sunglasses, the pick itself is just as stylish as you are in its tobacco tortoise finish. It arrives in a tin carrying case for throwing the pick in your bag and ensuring it's safety protected. This soothing and smoothing soap invigorates the hands and senses with the scent of rose, cinnamon, and patchouli. It's a spinoff of Hudson Made's similarly named shower soap, and smells every bit as refreshing. Sulfate-free and ideal for sensitive hands, especially in the kitchen. St. Patrick's day is this weekend, so you might want to go ahead and pick up some of the Hangover Tonic from Wooden Spoon Herbs. If you happen to have one too many Irish car bombs or too much green beer (or both), a couple of drops of this Hangover Tonic will help you bounce back Monday morning. It's packed with milk thistle seed and St. John's Wort that support healthy liver function while protecting it from damage. This helps those nasty toxins that are making you feel miserable move through your system faster — getting you back to feeling like yourself in no time. As for the ill-advised selfies with the leprechaun, it can't help you there. Usage: Take 10 to 30 drops as needed. Bixby prides itself for pinpointing the "optimum drag" of a comb: That is, the ideal distance between each tooth (1.3mm) and length of each (19mm). This provides gentle separation for detangling or distributing product without any tugging or torturing. Available in solid black or tobacco and carved from a single sheet of premium acetate, the fine-tooth comb from Bixby comes with a tin case for easy storage while traveling. The fine tooth comb is ideal for taming flyaways and facial hair, and best used for tighter and more polished styles. Founded in Winston-Salem, North Carolina, Fulton & Roark produces some of the best solid cologne around. As their first line of products, their everyday solid colognes led to a full line of products that include shaving, soaps, shampoos, and innovative aftershave cloths that utilize quality ingredients and are made for guys on the go. The solid colognes and aftershave cloths in particular are ideal for air travel when space is a premium and liquids are cumbersome. A more compact version of their full set, the Czech & Speake Air-Safe Manicure Set was built with globetrotters in mind. As the name implies, the manicure set is configured to comply with international carry-on restrictions, meaning it won't cause a fuss at security. Each of the Teflon-coated, TSA-friendly instruments are handmade in Germany with rounded edges. The Teflon coating repels grime, ensures proper hygiene, and provides longevity of the tools, while the rounded edges make air travel possible. Housed inside a grained leather case are nail-clippers, tweezers, safety scissors, and a crystal nail file. It's compact, handsome, and ready for a hop across the pond inside your carry aboard bag.